Italy has offered to help extinguish a huge blaze that has engulfed the biggest fuel depot in the Libyan capital, Libya‘s government says. It would send aircrafts and a team of experts to contain the blaze which has hit two tanks, the government added. 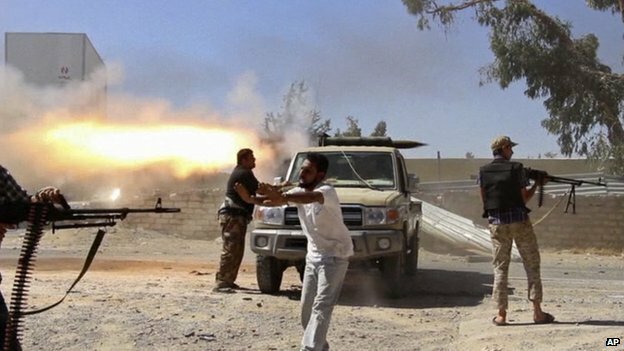 Libyan officials blame clashes between rival militias for starting the fire, described as “out of control”. Many residents of Tripoli are staying indoors, amid fears that the violence is spiralling out of control. 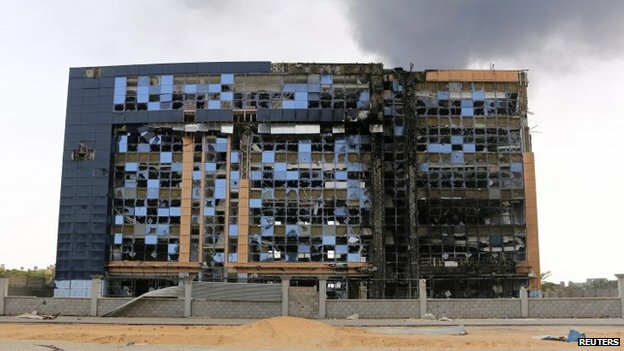 At least 97 people have been killed in fighting between rival militias battling for control of Tripoli’s main airport in the past week. The depot is about 10km (six miles) from Tripoli on the road to the international airport. The BBC’s Rana Jawad in Tripoli says that the mood among residents is grim, and it feels as though the city is being strangled because of the violence. People are angry, scared and mostly in disbelief at the recklessness of the militias and disregard for the potential wide-scale damage, she says. A lot of families who live on the road to the airport or other areas affected by stray rockets have fled their homes, our correspondent adds. 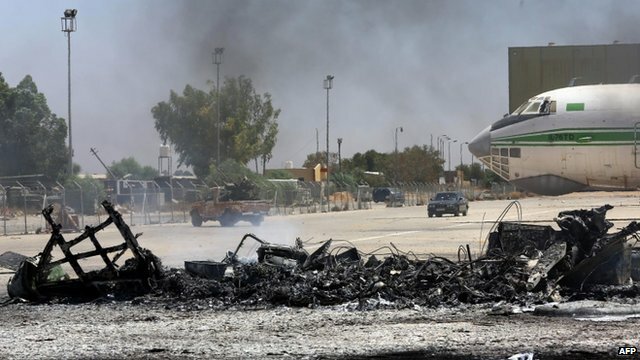 In a statement, the Libyan prime minister’s office appealed to “all sides to stop fighting and allow the experts and planes to successfully put out the blaze as soon as possible”. Both the Italian government and Italian oil company ENI would assist in extinguishing the fire, the statement said. 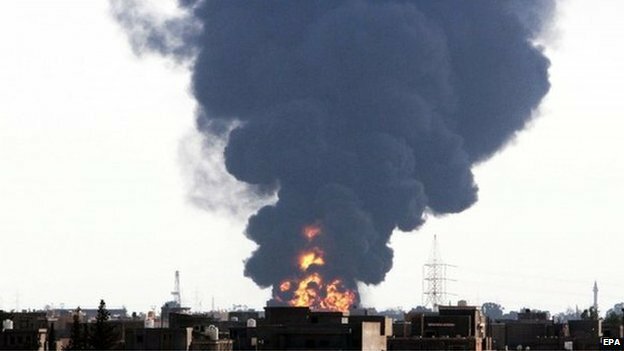 Fire-fighters almost managed to put out the blaze when it took hold of the first tank but had to withdraw after fighting resumed in the area, Libya’s National Oil Company (NOC) spokesman Mohamed Al-Harrai told the BBC on Monday. He said shrapnel hit the second fuel tank, igniting it. The fuel storage site, which belongs to the Brega oil and gas company, is the main hub for distribution of petrol in the city. The government has been unable to disarm the numerous armed groups controlling large parts of the country, which are behind Libya’s worst violence since the 2011 uprising that toppled Col Muammar Gaddafi. It has led some Western governments to urge their nationals to leave and withdraw foreign staff from their embassies in Tripoli. Libyan government officials have warned of the possibility of a break-up of the country if clashes over Tripoli airport continue. Members of the Islamist Libya Revolutionaries Operations Room (LROR) are trying to seize control of the airport, which has been in the hands of the Zintan militia since the overthrow of Col Gaddafi. In Benghazi, at least 38 people were killed in clashes between between troops loyal to the Libyan government and Islamist fighters on Sunday. Posted on 29th July 2014 by newsafrica. This entry was posted in Africa, Arab Spring, Libya and tagged BBC, Benghazi, Eni, Libya, Muammar Gaddafi, National Oil Company, Tripoli, Tripoli International Airport. Bookmark the permalink.